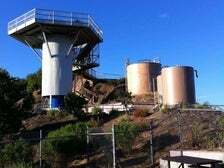 This challenging hike starts in residential Glendale at the intersection of Beaudry Drive and Beaudry Terrace. Pass a yellow gate and skirt a barbed wire fence guarding a dry creek bed. 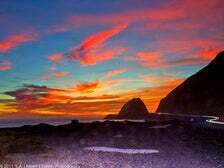 There's a dirt fire road that climbs up and around bends. Take a left at a fork toward the sign that reads Beaudry South Motorway. The San Gabriel Mountains soon rise on the left. Closer up, there are houses and the Oakmont Country Club golf course. The ridge switches from right to left, casting intermittent shadows. On the left, you'll see the Downtown skyline. 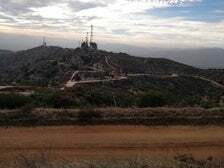 At the radio tower, continue past the Verdugo Motorway sign. The trail temporarily levels off before you continue a squiggly climb. On your left, the full expanse of the San Fernando Valley reveals itself. A cluster of red and white towers rises behind a fence. Descend a paved road. Take a hard right past a sign that reads Beaudry North. Occasionally, you'll spot lizards, cacti, dragonflies or hawks. Otherwise, the setting is serene, with very few people. Start by securing a USDA Forest Service Adventure Pass and hang it from your rearview mirror or rest it on your dashboard. This allows you to park at the trailhead, which resides at the end of Camp Bonita Road in the San Gabriel Mountains above Asuza. As far as the Bridge to Nowhere's difficulty, this trail isn’t especially grueling, but does require endurance, given the double-digit distance. The path snakes along the San Gabriel River, passing Shoemaker Canyon before veering right. The trail hangs left and cuts north at Laurel Gulch. Criss-cross the river, which can get hairy when the rain starts to flow, but you won't encounter a deluge all that often. Allison Gulch gives way to Rattlesnake Canyon, and ultimately, The Bridge to Nowhere, which lives up to its name. 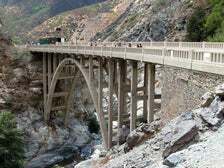 The bridge was built in 1936 to connect the San Gabriel Valley with Wrightwood, which is along the Angeles Crest Highway. The road subsequently washed away in a 1938 flood, ending that initiative. 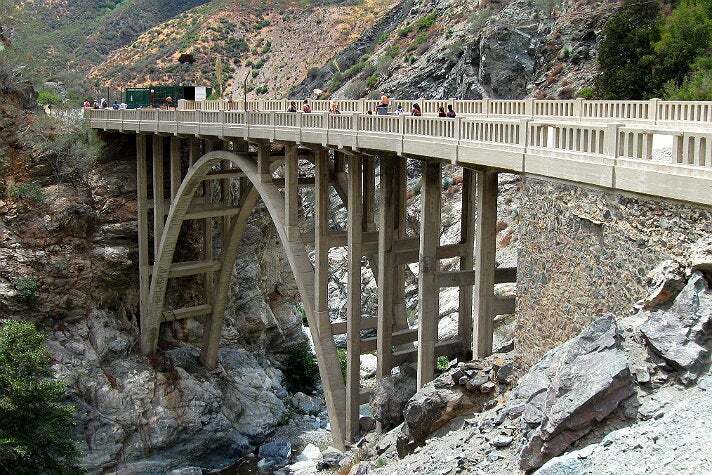 Now the bridge remains an arched curiosity, and perhaps L.A. County’s most popular place to bungee jump, which of course you should attempt only under trained supervision. To hike Echo Mouontain, take Lake Avenue north to the end, where the road bends left. At that corner, on your right, discover a trailhead. 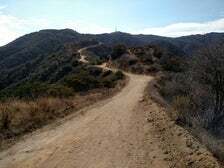 Hike east and curve north to the trailhead, the domain of wide dirt switchbacks that climb fast and steep into the heart of the San Gabriel Mountains. Look back and find prized views of Pasadena and the San Gabriel Valley, then keep climbing. Eventually, you’ll reach a fork in the road. Take a right and you’ll soon find the remains of Echo Mountain resort, which ran from 1894 before succumbing to crippling fires less than a decade after opening. 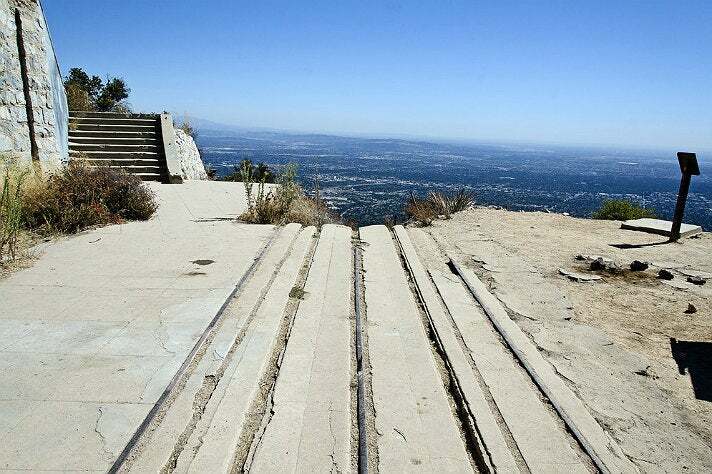 Mount Lowe Railway was a funicular that rose to a mountainside resort, and you’ll find some rusted remains. Echo Mountain and the railway are now all distant memories, but footprint remains, along with informational plaques, allowing you to explore Pasadena history and perhaps picnic before returning home. 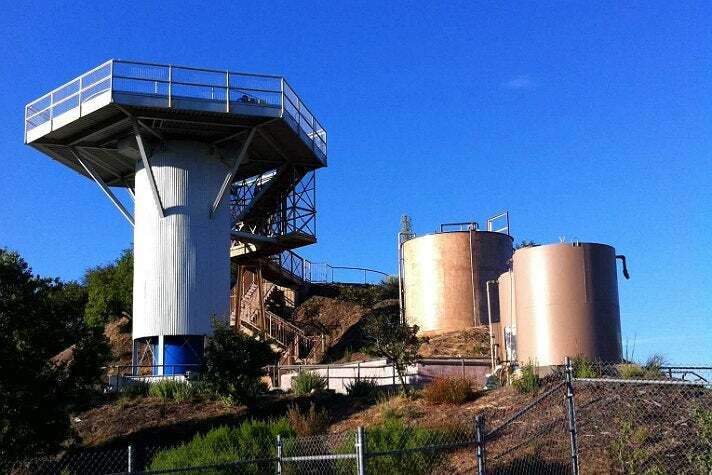 Start in a dirt lot by the 210 freeway and walk up paved road used for fire vehicles. Towering San Gabriel Mountains rise to your left. Take a right and climb a paved fire road toward "Hostetter," which soon gives way to dirt. The path wraps around the hills, bobbing in and out of shade. Climb to a T in Verdugo Motorway, where a clever sign reads, "Do not throw cigarette butts on the ground. Our squirrels are getting cancer." 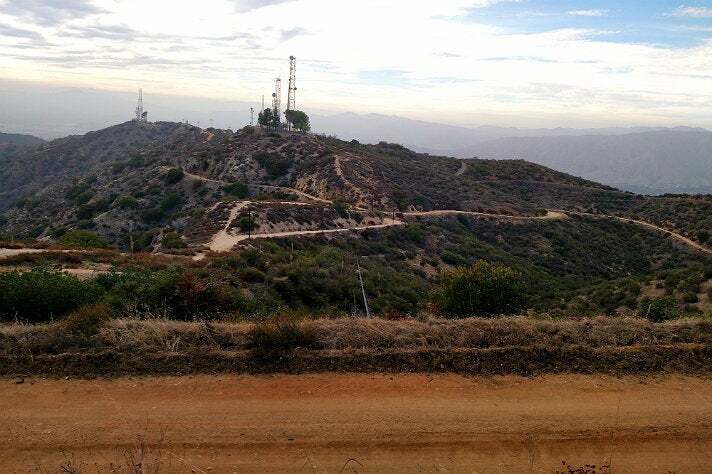 Take a left on the fire road and climb to a radio tower monitoring station. End at the fence and turn around. This is a popular trail with mountain bikers. You'll probably pass many, or vice versa. Salamanders are also around, if you look closely. During your descent, on the left, expect views of Downtown L.A., the Silver Lake Reservoir, Griffith Park and pretty much the entire San Fernando Valley. Park in the paved lot at the top of Canyon Drive. Walk north along the road, passing Camp Hollywood Land. Concrete quickly gives way to a dirt fire road that traces the hillside, ridge on your right, tree-filled canyon down to your left. At the 1.7-mile mark of your hike, you'll encounter a fork. Take the right. Plenty of horse poop lines the path, since stables are right below you, but it’s easily avoidable. The trail remains fairly flat, dry and exposed on the final rise. Once you reach pavement, take a right and climb. 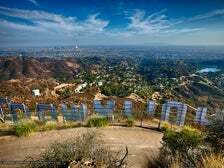 Near the top, you'll encounter white fence, views of the brown Griffith Park back country and the green Forest Lawn Cemetery. Corkscrew around to the south side of the mountain to see Lake Hollywood Reservoir and dead end at radio towers. 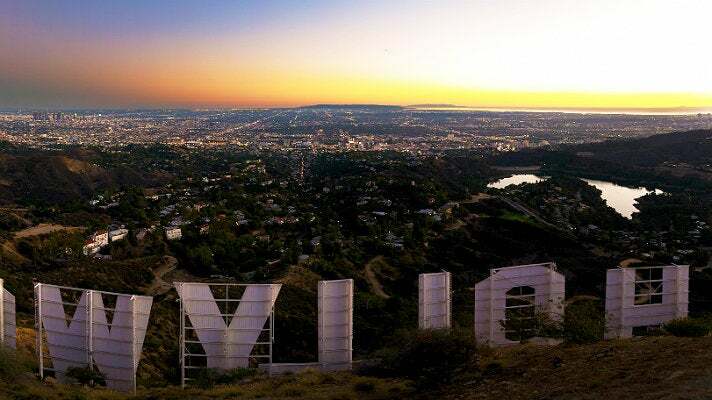 Look down to see the Hollywood Sign’s towering white letters and to soak in panoramic views of L.A., then reverse field for a mainly downhill hike to the parking lot. 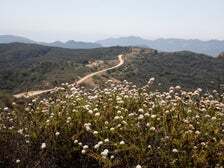 Pay $10 to park in the Topanga State Park lot, home of stables and picnic area. Start at the far end of the parking lot, where a family of deer might grace your path. Climb the fire road and turn left at a T. Take another right, dry meadow on your left. Soon, you'll pass a bench on your right, which looks out at homes on the next mountainside. 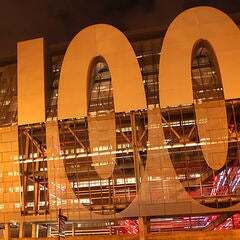 You won't find much cover, so either arrive early or late to beat the heat. Climb gradually along the fire road, red stone ridge to your right, green mountains and Palisades Drive subdivisions to your left. Keep rounding bends and the ridge rises to your left. 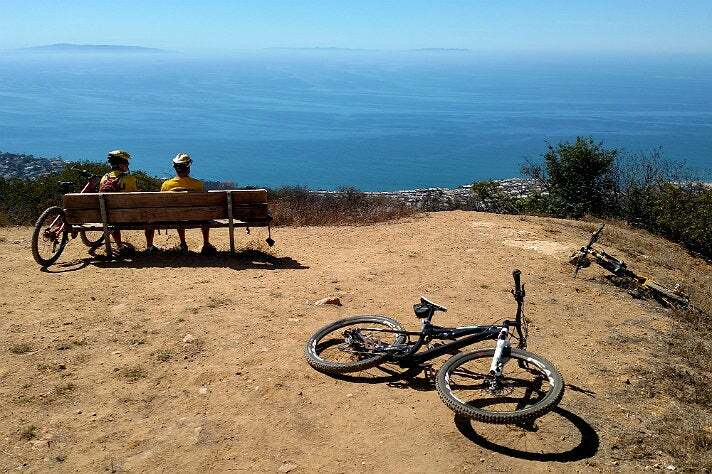 Climb gradually and take a right at the fork to reach Parker Mesa Overlook, a rocky single-track that culminates in two benches and prime views of the Pacific Ocean, Downtown L.A. and the San Gabriel Mountains. On a clear day, you can even see Catalina Island. Reverse field. Start at the Ray Miller Trailhead parking lot, near the Ventura County border. Pay $8 at an electronic meter for day pass, which stays on your dashboard. Take a single-track trail to the right of the yellow fence at the end of the lot. Climb past a campground, up into the Santa Monica Mountains. 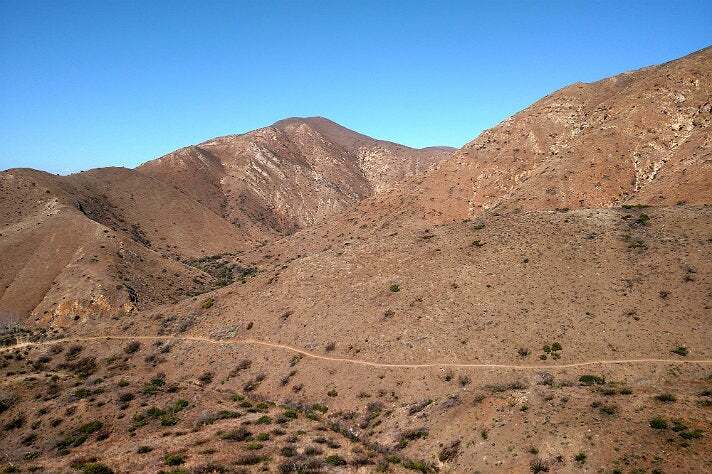 Expect exposure to the sun as the trail loops past cacti, succulents, and skittering lizards. Switchbacks climb ever higher, occasionally revealing crashing waves. Eventually, the trail levels off and reaches a ridge. Connect with fire road and take a left, where patches of green brush punctuate red dirt. At the 3.65-mile mark, you arrive at the gateway to the backcountry. Turn around unless you're bold. 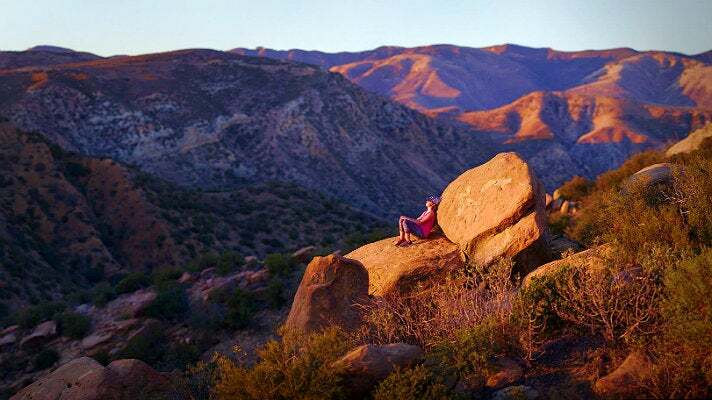 This Simi Valley hike is accompanied by an army of fire ants, set off down a desolate, boulder-lined path that rises above a small lot just north of the 118 freeway, located just a hair past the Ventura County border. Views are minimal on this trail, unless you crave glances of Simi Valley, the aforementioned freeway, and the occasional bird. We even spotted an unidentified species that resembles a small peacock, minus the dramatic tail feathers. A dirt road rises precipitously, passing the occasional park bench, which offer pleasant respites. 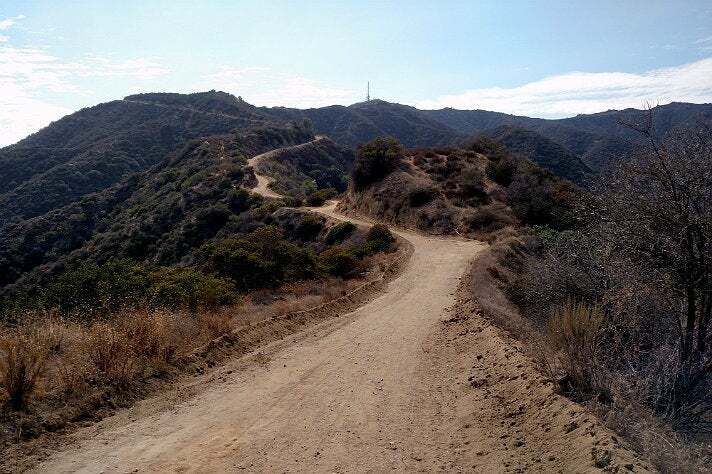 Take a left at the fork in the road, followed by a right, and you’ll pass big rocks with tufts of brush to reach the peak, which offers beautiful views of the surrounding Santa Susana Mountains, San Fernando Valley, and distant Santa Monica Mountains, as you expand your field of vision. Double back to your car to complete a short but strenuous hike. Westridge Road winds north from Brentwood’s Mandeville Canyon, passing multi-million dollar homes and the Getty Center on an adjacent ridge. The road dead-ends at a parking lot. Start past a locked gate up the Mandeville ire road up that winds above twin canyons, Sullivan and Mandeville. On your left, the Santa Monica Mountains open up, and you’ll soon see the Pacific Ocean and (at least after rain) a wealth of greenery. The trail plays hide and seek with the hills, many of which offer alternate (more strenuous) paths, ending at a historic Nike Station. This bygone military radar station, designed to help protect the U.S. from Soviet attacks, now delivers panoramic views of both the city and Valley sides of the ridge and picnic tables at the base. On a clear day, find a perfect view of Catalina Island, the San Gabriel Mountains, and the entirety of the San Fernando Valley.